In a rollicking new adaptation, Der Vampyr offers cultural parody, plenty of laughs and also dramatic intensity. The last performance at Boston Center for the Arts Plaza Theater on Saturday is “sold out” so it’s clear that OperaHub has a hit on its hands. I use quotes since the tickets are free, and that really is a marvelous part of the company’s goal of doing outreach to new opera audiences, a way to entice people who might otherwise be hesitant to attend. The 1828 opera is not unknown (I happened to see it when I was in Munich in 1988.) But it certainly is not part of the standard repertoire. 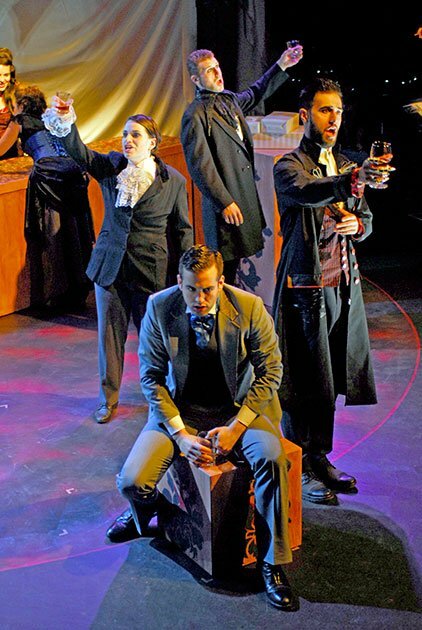 In “re-vamping” the libretto, OperaHub has brought Marschner’s beautiful melodies and exciting ensembles to life with a catchy new plot. With vampires as a mainstream theme in popular culture, the decision to stage a comedy referencing that theme seems savvy. On the whole, this revision is fun and refreshing and Marschner’s music, like most great music, can withstand such unforeseen uses. I am one who steers clear of popular culture, so many of the references—to best-selling vampire books, movies, television shows etc. —went by me, yet I could clearly see they were effective with the young audience. OK, I know there was a show called “Buffy the Vampire-Slayer” so having a character who introduces herself as “Muffy, the vampire-nay-sayer” is pretty funny. And I noticed that people laughed uproariously at Della’s line “I’m not a girl, not yet a woman” so I later looked it up and saw that it’s a Brittany Spears song. The joking and playful banter, and the macabre-mock-horror of the band of vampires set the tone for a fast-moving comedy. Moshe Shulman’s reduction for oboe, horn, violin, percussion, string bass, and piano was effective in retaining the varied timbres of an opera orchestra. Percussion and string bass gave real depth to the sound, and pianist Stephanie Mao got a real work-out in playing almost non-stop and filling out so much of the score; this was virtuosic musicianship. While all the instrumentalists played with wonderful flair and dependability, I was particularly moved by Miri Kudo’s lyric sensibility on the oboe. As music director, Lina Marcela Gonzalez kept everything tightly knit. The vocal ensemble continually brought out the warmth and intensity of the romantic score. Collins, the title role, was sung by Jacob Cooper. As the new recruit to the vampire lifestyle, he is charged with bringing in a quota of female victims. Cooper acted with great poise, lively conviction and appropriate scariness. His timbre was a little wobbly, and a bit muffled and in the back of in the throat. Luckily he often had a more declamatory style of singing which communicated with vigor. Megan Welker, as Lucy (Collins’ first victim), had a high warble but it was suitable to her character, which she played with real panache. As Della (daughter of Swann), Tamara Ryan’s agile voice was also a bit warbly and occasionally shrill, but on the whole her singing was compelling and her vivacious interpretation called to mind the comic genius of Madeline Kahn. Here is a little discursion on the nature of the young American opera singer in general. Too often we hear the operatic voice with a vibrato as kind of an overlay that unfocusses the pitch and thus detracts from the meaning of the melody and larger musical content. That was the case in several of the singers here. Though they were all such good actors, their singing needed to bring out the melodic lines—and words—with more clarity. Parker (who wants to marry Della, and who serves as Collins’s assistant) is a role that might be reconsidered. Given that Della turns against him so quickly, it’s hard to understand why she had been so eager to see him only a few minutes earlier. Later Parker realizes that he is being a jerk, with his selfish possessiveness, but why have that revelation happen twice (in quick succession)? Tenor Eduardo Ramos sang the role with warmth, and made us care about the character, although occasionally his high range sounded a bit brittle. Not that we aren’t used to accepting dramatic inconsistencies in opera but a newly authored libretto which has been devised to avoid the weaknesses in the original one, should do better. We expect more from it. Muffy (soprano, sung by Lindsay Conrad) is the vampire slayer who turns the victim role on its head. Her voice was loaded with the confidence and conviction (and aptly integral vibrato) of her feisty character. 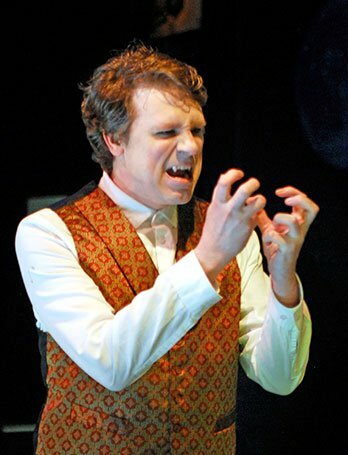 Giles (head butler, performed by Adrian Jones) was vocally and theatrically adept in his interactions, for instance in the clever staging of Muffy’s training in stake-throwing. As a mezzo soprano, Heather Gallagher was cast not as one of the vampire’s victims, but rather the moll of Aro, the leader of the vampire pack. She did get to have her say, in her bantering complaint song about how tired she is of doing all the work while the men just drink and mess around. Gallagher pulled off this comic role with real flair. Overall, the performance was of very high quality, and to witness it in such an intimate venue was a real pleasure. It was exciting to be so close to these vibrant, engaging musicians! The thrust stage gave the ensembles an immediacy as one singer addressed each section of the audience and then they rotated so we could take in another perspective. To place it even more in our faces, ample use was made of the two side aisles. The only disadvantage was in the large chorus; 12 operatic singers under such a low ceiling was a bit overpowering. The simple set made use of a screen behind the stage on which the singers cast shadows in humorous off-stage tableaux. The a cappella drinking song was a lively change of pace. This number was one of the favorites in the original version, and could now take on a life of its own in the a cappella circuit! I’m very happy that this work has been revived, and in a compelling new version. The vampire theme resonates with many recurring ideas of opera—the Faustian desire for eternal youth, Don Giovanni’s use of his class status in manipulating women, and the ability of musical language to depict the supernatural. The compelling overture was complete with a serious fugue in the middle. The sinister antics of the vampire gang were loads of fun; during the overture, one of the undead instructed another in how to form the proper menacing hand gestures. I did leave though with two cognitive dissonances that I’ve been pondering. First: on one hand there’s rollicking humor, banter, jokes, wordplay, overall goofiness and lots of laughs. On the other is a musical language that is built with expansiveness and expressive architectural structure that conveys soaring heights of human conflict and emotion. I would suggest that the music might be pared a bit more; phrases could be trimmed within arias and ensembles, to move the musical structure along with momentum, and to keep one from having the feeling that they are going on at too great a length about feelings that in the new plot are NOT that profound. The luscious melodies are definitely worth hearing, but the reshaping and pacing needs a little more tightening. And the second: I wholeheartedly applaud the feminist goal of the revision. As producer and director Christie Lee Gibson writes, “The resulting libretto … is a strong statement about our views on women’s independence in relation to historical patriarchal social structures and sexual violence.” I think that statement can be effectively made in the context of a comedy, which is what they’ve so effectively created. But this point is made too heavy-handedly by inserting a moment of genuine terror—when Swann slaps his daughter Della to demonstrate his control over her. After having had (by that point) more than two hours of laughs and comedy, much of it very physical, here was a shocking moment of sobriety. Of course we are building up to the return of Muffy to save the day, but the tension was out of place and made Della’s victimhood give rise to awkward laughter and bathos. The point would have been better made by keeping a light-hearted tone. We can still sympathize with Della, and see the injustice of the situation, and cheer when Muffy comes back from the dead with the moral of the story: A woman is not just a piece of property, for boyfriend, father or vampire to possess. Now I challenge OperaHub to take its themes of women’s empowerment to other operas—ones that people know—to confront the cognitive dissonance that we face when we enjoy this powerful art-form that is so replete with the power of misogyny. I am ready with my revised librettos of Carmen (and Madama Butterfly, Rigoletto, and a few others).